Did you get to hang out with the OKC Thunder today? 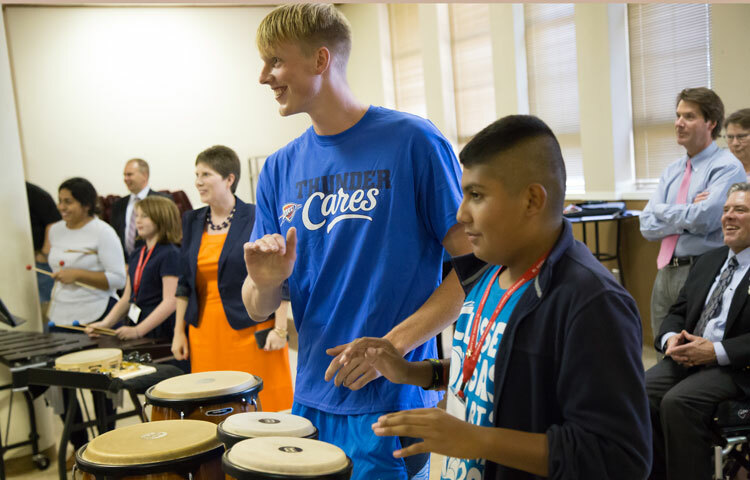 The Oklahoma City Thunder made a surprise visit to El Sistema Oklahoma today! We welcomed Thunder players, Kyle Singler and Josh Huestis. These wonderful players held an assembly for the Orquesta Nueva and then sat in with the Orquesta Alegria and Orquesta Esperanza in their rehearsal this afternoon! They shared about what it means to be a member of a team and how it takes time to develop the skills we need to be successful. They praised the children for their effort and dedication to El Sistema Oklahoma and to learning their instruments. They complimented the children on how they are smart, helpful, positive and respectful every day. THANK YOU Oklahoma City Thunder! You made our day!